This is a dish that I only caught the end of on an episode of Food and Drink with James Martin but it caught my eye as both the OH and I love a stir fry. Having never experimented with an Indian Stir Fry before, I thought I would give it a go. I didn’t have to make too many changes to this one as the point of the episode was healthy recipes. I did however omit much of the oil (unnecessary calories!! ), regularise the portion sizes and up the spices for more flavour! You can see the original recipe here. Begin by marinating the beef, In a large bowl, mix together all of the spices until well combined. Stir in the lime juice to form a smooth paste. Then add the beef and mix until completely covered in the marinade. Cover the bowl with cling film and chill the beef in the fridge for at least an hour. Once marinade, you can begin preparing the rice. Pop the rice on to boil and then meanwhile, heat the oil in a lidded pan over a high heat. When the oil is hot, add the mustard seeds and cover the pan with the lid and reduce the heat slightly (the mustard seeds will pop and can jump out of the pan – so be careful). Once the mustard seeds have popped, remove the lid, add the cumin seeds and curry leaves, and stir-fry for a few seconds, until the cumin seeds start to darken. Add the chillies and ginger then stir-fry for a further 1-2 minutes. Then add the tomatoes and lime juice and stir-fry for a further 2-3 minutes until the tomatoes start to break down. Remove the pan from the heat, allow the pan contents to cool slightly, then stir in the yoghurt, coriander and cooked rice. Season to taste and set aside, keeping warm. Once the rice is on and keeping warm, you can start cooking the beef. Spray a large pan with 1kal and add the marinated beef pieces. Stir-fry for around 3-4 minutes, until evenly browned. Remove the beef pieces from the pan and set aside on a plate. Return the pan to the heat, spray with 1kal and add the ginger and garlic and stir-fry for 1-2 minutes. Then add the onions and continue to stir-fry until just softened. Add the peppers, spring onions, plum tomatoes and chillies to the pan and continue to stir-fry until the vegetables have softened and are starting to colour. Drizzle in the juices from the reserved beef and season to taste. When almost all of the beef juices have evaporated from the pan, add the beef back into the pan and toss for a minute to reheat. Remove the wok from the heat and stir through the fresh coriander. 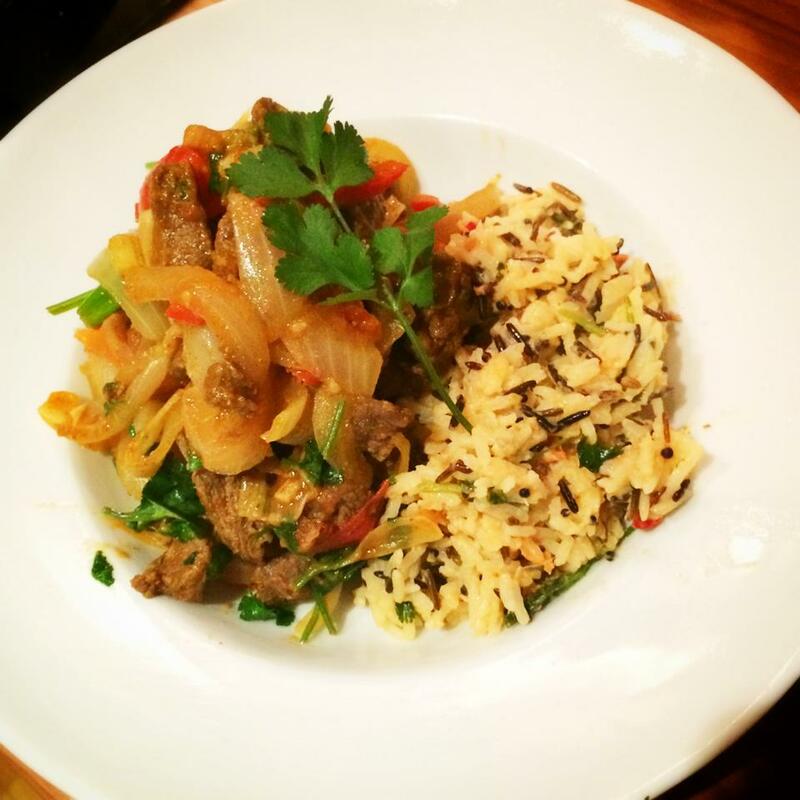 To serve, divide the yoghurt rice equally among serving plates and spoon over the chilli beef.